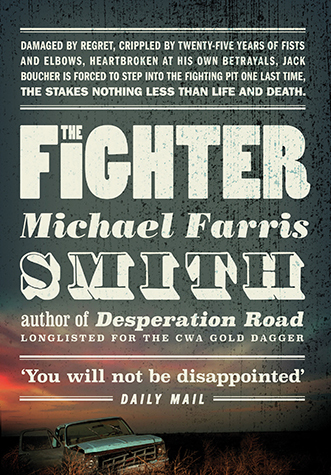 The Fighter is the follow-up to Michael Farris Smith’s debut Desperation Road, which was longlisted for the UK Crime Writers’ Association 2017 Gold Dagger Award. And it could well have been given the same title as it charts the build-up to the final fight of ageing cage fighter Jack Boucher. It may well also find itself on long and shortlists itself when award season rolls around. Set in a depressed American South, from the opening Smith perfectly captures an air of desperation tinged with hope that somehow always seems to go awry, because life just does not work like that. He felt the pain in his head from concussion after concussion after concussion and he lived in the blurred world of a rocked mind. He felt the streaks of pain through his eyes and down his spine and he felt the burst of bright lights and the sharp, unexpected noises of the modern world that screamed through his brain. Broken fingers and dislocated kneecaps and sprained neck and gashed skull and again and again and again the fists and knuckles and knees and elbows and he felt it all as if every blow he had absorbed and every blow he had delivered still existed somewhere in an invisible cloud of pain that draped and held him like some migrant soul in search of a home. The years’ passions and his body rusting and his mind like some great wide open space with howling and twisting winds and swirls of memory that could not differentiate between now and then and he felt it all. All her extra money went to the tattoos. She added more butterflies, a string reaching from her wrist up her forearm in the pattern of a lazy S and she could never decide if it looked like they were coming or going … A crown of thorns circling her elbow. Up and down her calves and around her knees wrapped serpents and vines and then she chose clouds and crosses and birds on her thighs as if to offer escape from the venom and thorns twisting below … Then she added the wings to her shoulder blades and to the tops of her feet, believing the symbols of flight and movement may give him the notion that she wasn’t going to be there much longer. … erected around the piles of debris. The concession stand right in the middle. The tents for the rigged games in a staggered line over to the right. The rides going up where they could find enough consistent space. The Tilt-A-Whirl and Tornado and Slingshot. A maze of cracked mirrors and a carousel with missing horses. Bumper cars and a tiny racetrack where toddlers sat on stumpy elephants and zebras and held on as they motored in a clunky circle. Intercut with the present-day narrative are flashbacks to Jack’s history. Jack was literally left on the doorstep of an orphanage as a baby and then moved from foster home to foster home until, at 12 and half-wild he is taken in by Maryanne. Maryanne gives him a home and a life but he still has fight his way through school and as a teenager naturally gravitates towards cage fighting as an outlet for his fists and his rage. … Annette unhitched the camping trailer from the pickup as she drove into town … Passing sale lots lined with tractors and farm equipment … Car repair and tire repair and a pawnshop with a motorcycle sitting out by the road with the front wheel missing and propped on a stack of bricks, the sign across the handlebars reading AS IS … Annette drove slowly past empty banks. Empty department stores. Shells of yesterday. But she found life at the coffee shop on the corner. The Fighter is a poetic and often dark look at the American South. Smith takes readers deep into the physical and spiritual heart of the landscape, building inexorably to a brutal, no-holds-barred finale. While many here accept their lot, Jack and Annette become emblematic of a population that will not allow setbacks and hardships to define them. And in this way The Fighter is also a very personal story. Both characters are trying to find or retain the human connections that will sustain them in an increasingly hostile world.